Gauri Shanker Rudraksha has no linings on its surface. This bead is the combination of two Rudrakshas joined together naturally. This has no particular shape. The deity of this Rudraskah is Lord Shiva and Goddess Parvati. One bead, out of this joined Rudraksha, represents Lord Shiva and the other Goddess Parvati. This Rudraksha’s ruling planet is Moon. This bead represents, in particular, union of husband and wife. Whenever, there is any problem in the married life relationship, this bead is sought after. This bead is considered very powerful. Today’s life style brings strain in relations, may it be the relations of wife and husband, friends or any other family relations. To avoid such situation, this Rudraksha is recommended. The wearer gets the blessings of both Lord Shiva and Goddess Parvati (Gauri). Misunderstandings between husband and wife are removed and they are able to lead a happy married life again. 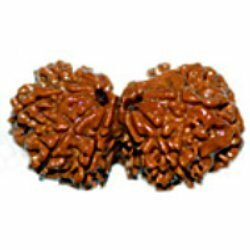 Gauri Shanker Rudraksha brings peace of mind, harmony in relations and overall prosperity as well. This bead is also recommended to those who are unmarried and seeking suitable soul mate for happy married life. It is believed that this bead also helps in progeny.